If are looking for inspiration for outdoor furniture, look no further! Many people enjoy spending time in their garden or patio area so why not incorporate a few pieces of furniture to make it more comfortable and homey? Patio furniture can certainly be expensive, but we wanted to share a few ideas that are not only gorgeous, but thrifty. 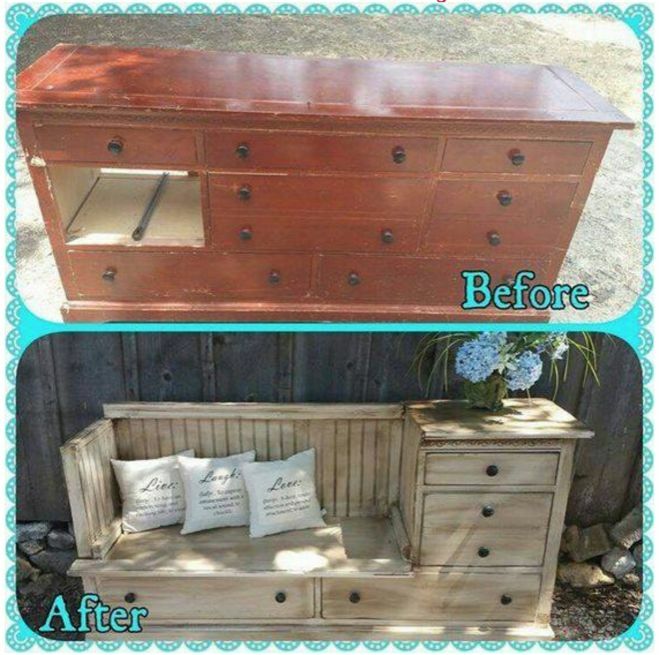 We have found a few innovative ideas to help you get more seating and storage in your garden space by re-purposing an old dresser. You may be surprised at many different looks you can create. Let's take a look at the different design options. 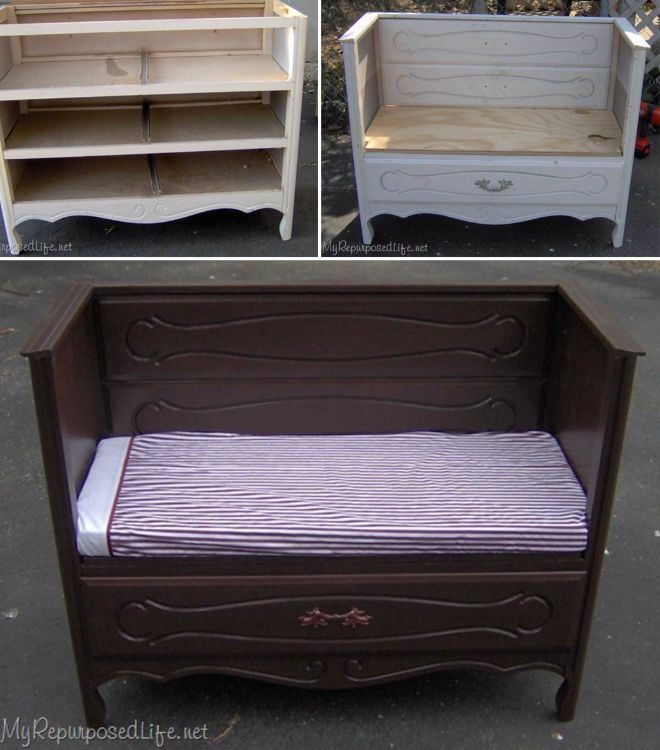 This idea is perfect for smaller dressers. 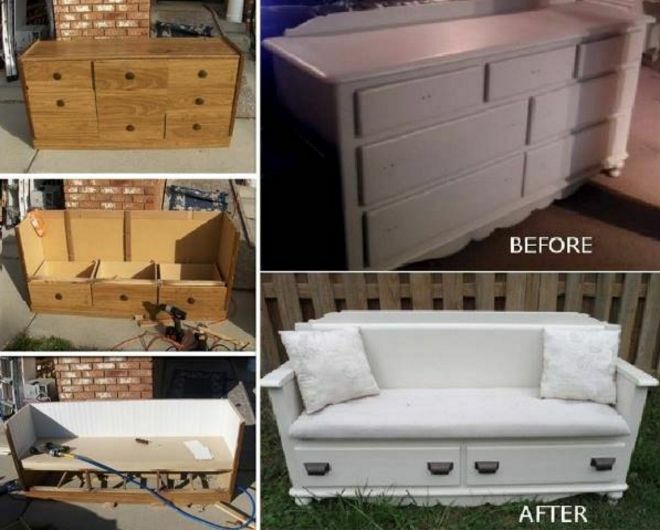 My Repurposed Life shows how removing the top drawers opens up just enough space for a cozy outdoor seat. You can even leave the bottom drawer as functional for garden supplies. The front panels of the removed draws can be used as detailing on the back board. Another great idea for a smaller dresser. Remove the sides for a more open look. This piece also shows how distressing the paint can make it look a bit more French-country for those of you who prefer that type of look. If you have a larger dresser, it can mean even more storage! Dress up the look with painted handles and accents. For easier cleaning, you can opt to not include a cushion and just leave it as exposed wood seating. This is a great idea for outdoor use in your garden or patio. This is a great option pictured in My Incredible Recipes even if the dresser is missing a few pieces. 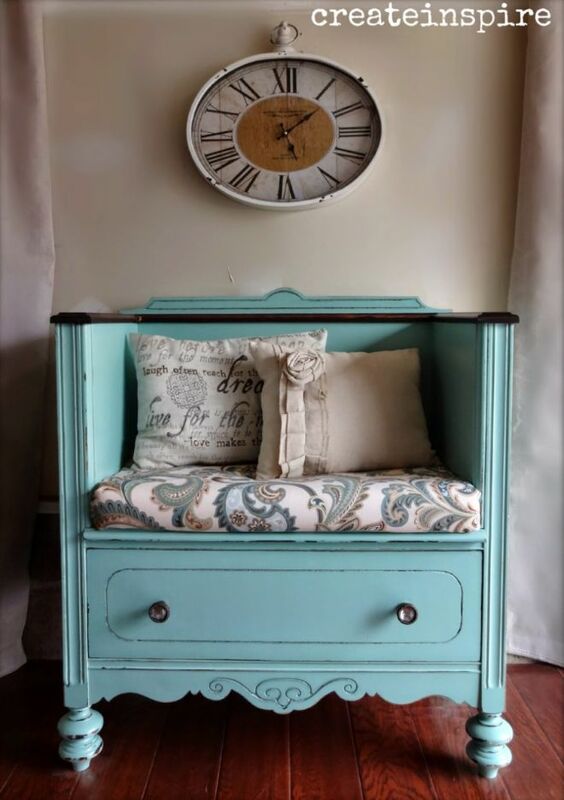 You can transform the piece into a shabby chic bench by simply removing the center drawers, but keeping the side drawers and a couple drawers underneath. Throw on a couple of pillows for added appeal. Not to mention, the side can serve as an end table to put your coffee cup on or to display your outdoor planters. If you need additional seating, this is a good option for you. 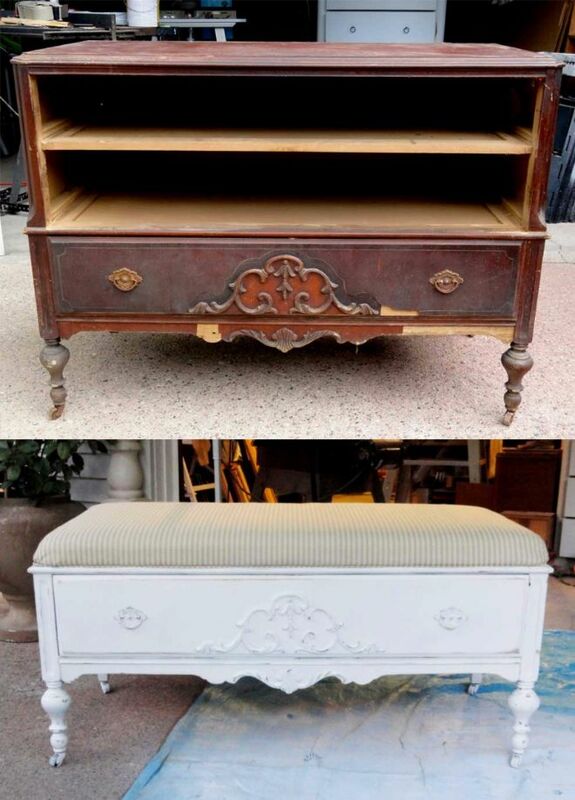 Remove the top half of the dresser and only leave a couple of drawers on the bottom. You can redo the drawers altogether so that they are smaller or larger to suit your storage needs. This precious idea comes from Create Inspire. Ideal for a small dresser, you can incorporate this bench idea into your garden as a seat for child, or just a cute centerpiece. 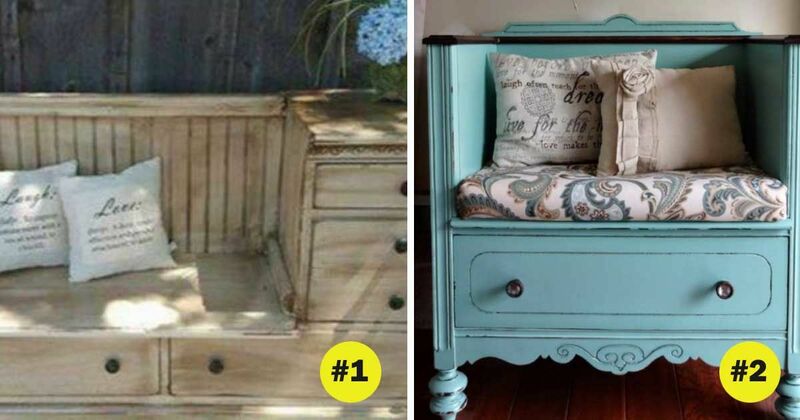 Which bench will be your weekend project? Having trouble deciding? Share with your friends to get their vote! Is your soil so poor that it needs serious amendment to grow anything successfully? If so, straw bale gardening might be the perfect alternative solution for you.